We didn’t really think this could happen — that someone could dominate our 2nd Annual Sizzling Summer BBQ Contest like Barry Bonds winning MVP Awards in his drug-buffed prime — but we were wrong. For on June 15, the O Street Truck and Liz Bradley drove out of the Whole Foods parking lot doubly victorious, taking the crown for both best professional entrée and best professional side dish over five very talented competitors. But perhaps it’s fitting for an age when so much of the hottest food gets served from a truck. Want to read the rest then go do so at the Indy's site. If the produce at a Farmers’ Market doesn’t inspire you to cook, you either have vegetable-phobia or as many kids as the Duggars and have no time. But while that perfect late spring fava bean might suggest a lovely meal (amazing aside king salmon, say), it’s also a ton of work you might not be able to do — first a de-podding, then a boil, then a peel! — in a given night. So perhaps you want to buy produce one night for the next, and just get a quick meal pronto. The Wednesday Farmers’ Market at Harding University Partnership School, 1625 Robbins Street, will now be the first of the markets to feature a food truck — and not just any, but one of the Santa Barbara School District’s Mobile Cafés that were the hit of Earth Day this year, and are obviously allowed onto school property. We’re talking organic food, often Mexican cuisine, made to keep schoolkids not just healthy, but happy, too (and you, parents, know how hard that is). So it’s going to be good in more ways than good usually knows how to be. The Mobile Café will be at Harding from 5 to 7 p.m. tomorrow, Wednesday, June 29, while the market runs from 3:30 p.m. to 7 p.m. Check it out so it keeps coming! Most menu readers know this, but you can’t always believe what you read in a restaurant. Even in this age where it seems necessary to tell us the provenance for every blasted ingredient right down to the four types of salt, some people are still leaving a bit of mystery. For instance, if you ordered the heirloom tomato salad currently on the Cádiz menu, you’d see it’s coming with Piave cheese, spring greens, and Banyuls vinaigrette. What it doesn’t tell you is there’ll be a lovely little swath of caramelized shallot purée on that plate, and it will be something you crave afterward. Want to read the rest, then go do so at the Indy site. There are things you're just not supposed to do with an ice cream scooper, like, say, gouge out a person's eyeballs or drop globoids of Kool-Aid-and-flour into boiling oil. That didn't stop Charlie Boghosian, though. From doing the second thing, that is--I assume he's safe around people's peepers, and if you watch the video at the link the good news is he probably can't outrun you, unless you too live for the moment each summer when the San Diego County Fair opens the latest fried-thing booth. And it seems people do just that, as a sort of ever-escalating thrill ride (Big Artery-Bust Mountain? ), dropping anything they can think of into oil--Twinkies and Snickers are just child's play. Perhaps there is a point when adventurousness just becomes silliness. But then I haven't ate the Kool-Aid, so what do I know. Since there's a new pup in Georgeeatsvania, we've been spending a lot of time tracking down places with patios that allow dogs so our four-legged friend can come with and we don't have to be worried that he's home figuring out which parts of the house taste best mouthful by pointy little puppy teeth mouthful (he's even tried to chew on cast iron lawn furniture, so you just never know). Turns out more and more places are being nice about doggie diners, so here's a quick round up of three recently stopped at spots. This spot now has a 48-tap beer engine pouring all sorts of hoppy goodness, so discovering they had a tiny bit of bricked in, concrete floored garden where we could sit with the dog was great. Unfortunately, being dog friendly also means they turns their back on patio-smokers, as if one gets cancer from second-hand-dog, but a canine-companion life often leaves one in a second-class world. That said, again the help was great, and our waitress even chatted about what he was and the dogs she had (who weren't well-behaved enough for going to pubs). Of course MWC and I had Plinys, how could we not. And we asked about the Craftsman Aurora Borealis, supposedly featuring mint and persimmon, which we figured could either be a delicious summer refresher or a pound cake in a glass. Our fine waitress warned us they can't give the stuff away and brought us tasters, and we learned why. Beer shouldn't taste like it's brushing your teeth for you. Oh, and as for the food, we split fish and chips for a late lunch. Some of the best, crispest chips we've had, and the fish was solid--great coating, but the fish itself ok, nothing to get worked up about either way. I'm sure we would have liked it more if we had more time to have more beer. Go check out the website and the beerlist here. I've been here many a time, most frequently because its the site of some amazing beer fests, like this Belgian one I extolled the glories of long ago. All the Pizza Port's make great beers--all on site and in what seems to me a friendly competition--and serve up puffy-crusted pizzas that do a fine job soaking up the usually high alcohol suds you can get to drink. This time the patio was abuzz (it was Father's Day) with families and silly people with human babies and not doggie ones, but our boy was well-behaved and met people of all ages (the youngest ones' hands taste best, you know)(or so he tells me--I don't lick the young kids' hands myself). Guest beers included some rarities like a Green Flash Le Freak aged in grenache barrels (and you certainly could taste that wine), but then their own Wipe Out IPA, which isn't an Imperial and is still over 9%, so take that, hopheads! Get the full scoop at their website. Oh, and if you don't know the song the title of this entry comes from, Perry Como's going to croon for you. That photo is a bit blurry, sure, but so would you be after a cocktail contest. Still, if you want to read about that, you have to wait till the June 30 issue of the Independent, when all the BBQ & cocktail contest dirt goes down (actually, it was pretty cleanly delicious, but you'll see). So, after drinking 5 cocktails (that is, tasting 5) in a little over an hour, and then commingling and co-drink-ling with winners and non-winners (can there be a loser at a cocktail contest?) alike for a bit, as cocktails are nothing if not the grease for society's wheels, I came home with my sweet companion who did not drink and therefore did drive, and hunger followed. We opted to play that game "what can we make with what's in the house?" and luckily our house was filled with raw goods goodness, so soon Farmers' Market cherry tomatoes were slow roasting, pasta water was boiling, pesto was grinding in the blender, and it was left to me to put my shaker to tasty use. And, after a cocktail contest, what else could I do but try something new? 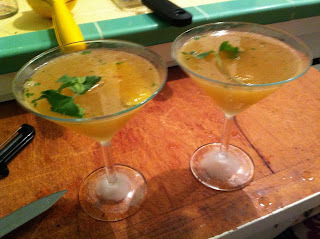 That got garnished--and you have to garnish, people, or it's simply not a cocktail, it would be like going outside without a natty hat in the 1950s, and you wouldn't have been one of those philistines, would you?--with a sprig of cilantro and a wide lemon rind. Name of the drink: Thai'd and True. In which Georgeeats gets all multi-media, as my mellifluous tones are a mere couple of clicks away. For, you see (and hear), I was a guest on the fine radio broadcast "Poodle Radio" last Thursday, and that segment went a little bit like this. As it's described on the Indy site: "Colin Marshall talks to Indy food editor (and fellow KCSB host) George Yatchisin about the second Second Sizzling Summer BBQ Contest, which will feature dishes with countless culinary implications like coke-injected tri-tip; chorizo picante-stuffed, bacon-wrapped date with nora chile-infused honey; and slow-smoked pork shoulder, jalapeño and green chili corn waffle, horseradish cole slaw, and homemade barbecue sauce." Now don't say I never invited you to anything. P.S. Extra special prize for anyone who gets the odd reference in the title of this post (without Googling). I know I perhaps seem too kind to places, too fortunate in my eating life, as if the meals I enjoy bore the imprimatur of Escoffier himself. Truth is, I tend to avoid the places I don't like, so then I don't eat much bad food. And while some of my Indy features are about places that suggest the quit in adequate, well there, dear readers, I hope you realize I write as a reporter, talk to folks about their story creating their restaurant, and hope that's an interesting read. But today I come to praise to high heavens, to try to pay homage to one of the best meals in my recent memory. A few weeks ago in Boston we got to dine at Hamersley's Bistro, a place I've wondered about for years thanks to Gordon Hamersley's great cookbook Bistro Cooking at Home, which I've raved about before and is still one of my go-to books in the kitchen. It's a lovely warm room that manages to call out to several architectural styles without seeming confused--warm yellow-cream walls that are somewhat Provence; wood beamed ceiling that might be Provence, might be Paul Revere's house (this is Boston, after all), chandeliers that are simple and somewhat Mission style, but maybe that was just the Californian in me. It all ends up both homey and glowy at once, special but comfortable. And despite some large parties (clearly it's a place for special occasions), there's enough space between tables and the ceiling is high enough the room is a-buzz without turning into buzzkill. Then the help, well, it's gracious and attentive, and lord I love people who get paid well enough to make a career as waiters, so they bother to learn their jobs and care. They suggest wines with aplomb and knowledge (for spring there was a clutch of pinks to choose from, and the very moderately priced 2010 Commanderie de la Bargemone Coteaux d'Aix en Provence Rosé was brilliant, flavorful despite its very pale pink rose hue); they instantly notice the cream might be low for the second coffee serving; and I swear the guy just sort of had eyes that twinkled. But of course, as he's serve Hamersley's stunning food. The photo you see above, taken from my iPhone, does little justice to one of the best plates of food I've ever eaten, and it was a goddam sandwich. Or at least that's how it's billed--Mushroom and Garlic Sandwich on Toasted Country Bread--but that's like calling Neko Case a warbler or Willie Mays an adult at a child's game or Flaubert a teller of tales. Those mushrooms, well, the quality of them and their nifty mix of wildness certainly helped. But then he gets them to do that stick to the pan trick, too, so parts have crunch, but then other parts retain that shroomy-chewiness. Who knew a funghi could be so varied in texture? The bread was also wonderful, toasted just so, assertive just enough (for after all it's about the filling, not the bread here, and you eat it with knife and fork--it's not even a conveyance mechanism). Finally, the garlic. It's clearly roasted loooong and sloooow. Mellower than a mess of Quaalude popping clubbers in the 1970s. Yet still the essence of garlic without the harm. Better than butter, this. As for the rest of the meal, it, too, was wonderful. My companion's Crispy Vegetable Lasagna with Ricotta, Soft Poached Egg, Leeks, Peas and Asparagus … White Truffle and Parmesan was both rich and light, if that makes sense, lasagna dressed up for an elegant bash. My Spicy Halibut and Clam Roast with Bacon Braised Greens, White Beans and Black Trumpet Mushrooms, beyond having practically every food I love in one dish, was a masterpiece of execution. That spicy part a brilliant rethinking of blackening fish, for instead of a muddled, burnt crust, it was just the right amount of herb and spice with a quick pan sear, rich in coriander seed, too. The clams cooked exactly--not overdone as they often are when supporting players on a plate. Then dessert was another stunner, Slow Roasted Pineapple with Lime Gelato, Roasted Coconut and Cumin Shortbread. What that doesn't tell you is the thinly sliced rectangles of pineapple are not only roasted, they get brûléed at the very end, too, so become a sour-sweet sensation. Pair that with the zippy lime gelato, getting its sweet from: 1) being, uh, gelato, and 2) the roasted coconut. Triple it with the cumin shortbread, again, the savory and sweet doing a tantalizing tango across your tongue. Ok ok, that was a totally over-the-top metaphor, but it's the kind of thing Hamersley's leads to. If you're ever in Boston, go.